“She did, she did. Look, look, didn’t I tell you? Oh, her father didn’t notice,” and the perky laughter follows. The Main Hall of the Cairo Opera House was filled with children. They came in hundreds, with their schools, to attend a matinée performance of Coppélia by the Cairo Opera Ballet Company. Throughout the four days, between 20 and 23 October, two out of six shows were staged in morning hours, allowing the youngest audiences to enjoy this simple, almost naïve, yet charming fairytale by E T A Hoffmann, materialised on stage by Romanian choreographer Valentine Bartes, costume designer Gianluco Saitto and scenographer Mohamed El-Gharabawy. The basic plot of Coppélia is enclosed in the ballet’s first two acts and tells a story of a human-sized doll that catches eye of Franz, inciting the jealousy of his fiancée Swanhilda and leading to confrontations with the dolls’ eccentric inventor, Dr Coppelius. Though the third act is linked to the main plot, it is rather a divertissement that gives room for the virtuosity of the dancers. Since its first staging in 1870 at the Paris national opera, Coppélia has become one of the most captivating works in ballet companies’ repertoires. Not only it owes its unique positioning to the enchanting story that speaks to the hearts of the whole family, but also — and probably above all — Coppélia’s beauty is wrapped in Leo Délibes’ captivating and particularly evocative music, well adapted for dancing, where folkloric accents, spirited mazurkas, energetic czardas and melodious waltzes meet classical ballet and music. The work is filled with humour, lovely thrills and intriguing mysteries, giving it a lively, burlesque touch in the second act. Moreover, the ballet parallels dance numbers, solos, duets and group scenes with a lot of room for acting and pantomime. Above all thematic, structural and technical elements, however, the ballet’s artistic secret lies in the many little challenges that if well executed — as it was in the case of the Cairo staging — render the work unforgettable to audiences of all ages, and equally touch the hearts of ballet and music aficionados. 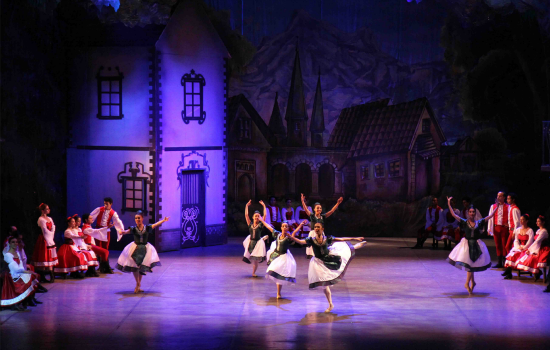 Staged for the very first time in the history of the Cairo Opera Ballet Company, Coppélia has definitely engraved itself as one of the most important and masterfully executed works in the troupe’s recent history. “Fragments from the ballet’s third act were choreographed by Abdel Moneim Kamel in 1984, at El-Gomhoreya Theatre, at the times when the troupe (back then called the Cairo Ballet Company) was still affiliated to the Academy of Arts,” Erminia Kamel, the Cairo Opera Ballet Company’s artistic director, told Ahram Online, underlining that this is Egypt’s premiere of Coppélia. Opening the season with Coppélia, Kamel invited internationally renowned artists to work with the Cairo troupe. Romanian choreographer Valentin Bartes has a large biography of successes in his home country, including four gold medals from the Romanian National Ballet competitions, and several other remarkable achievements, particularly in Croatia and Japan. In Cairo, Bartes based the timelessness of Coppélia on the original choreography by Arthur Saint-Léon, adapting it to the Egyptian troupe. “It is a very mixed company, with different heights and personalities. They all managed to capture the characters very well,” Bartes told Ahram Online. Indeed, throughout the whole performance, the company used their dance and acting skills, as well as emotional charge, and responded well to the demands that came with a complex mise-en-scene, and theatrical and pantomime inserts. In the matinee performance on Wednesday, 21 October, Kateryna Ivanova danced Swanhilde, Ahmed Nabil took the role of melancholic, and lured by Coppélia (Nada Amr), charm Franz, while Farouk El-Sherif personalized the wicked Dr Coppélius. “Performed a total of six times, the ballet relies on three casts, which even include changes in the corps-de-ballet. It is a demanding production calling for 70 dancers on stage,” Kamel explains. Undeniably, Dr Coppélius is probably the most complex and as such the most attractive character of the story, giving space to many interpretations of the role. The old man is a sort of a loner who surrounds himself with life-size dolls that he invented himself. His undeniable masterpiece is Coppélia, the inventor’s source of pride that also triggers in him fatherly, even if very possessive, emotions. A crazy inventor, a father, a combination of an eccentric old man and a fresh — not to say youthful — energetic character, Dr Coppélius charms in his mischievous annoyances and captivates with his imagination and magician-like powers. While there are many readings of Dr Coppélius, Farouk El-Sherif chose to depict him as an older man, maybe a quack whose ailing body and sore back becomes the comic nucleus of the character. It is in this role that we discover El-Sherif’s acting talent, which complements his classical ballet skills. Youthful vitality was fully embodied by Ahmed Nabil as Franz, a role that allowed him to showcase his abilities as one of the undeniably best dancers of the Cairo Opera Ballet Company. As Franz, Nabil used all his technical capability to depict a strong, charming, sincere, yet playful young man. He did not spare us several impressive movements — particularly the high jetés en manège and clean jetés entrelacés — in the final act. He remained equally capable in a few pas de deux, manifesting good synergy with Swanhilde, danced by yet another talent, Kateryna Ivanova. Part dance, expressive pantomime and acting, where detailed work in choreography and mise-en-scene brought the best from the Cairo company, Coppélia is fertile soil for the scenographer and costume designer to showcase their artistic explorations. Cairo’s performance did not betray the audience on the visual level. Kamel invited Italian designer Gianluca Saitto to create the costumes from scratch. He was supported by Carlo Moregalli, a renowned artist whose name is linked with a number of famous choreographers and directors. Moregalli’s biography includes artistic direction of the Royal Theatre at La Villa in Monza (1996-2001) and cooperation with famous Italian first dancers of La Scala Theatre. Though Saitto’s primary education is in architecture, his artistic endeavours directed him towards traditional craftsmanship and the secrets of artistic tailoring. Today, he designs costumes and works as a stylist for numerous celebrated Italian singers. One of his main passions is the art of Egypt, from which he draws inspiration, reflections of which are also found in the Cairo production of Coppélia. Saitto told Ahram Online that having arrived to Egypt with sketches several weeks ago, he paid many visits to Wekalet El-Balah, a large textile market located in Cairo’s popular area, where he chose the fabrics and embroidery elements, and then began the tailoring process. He decided to keep the first act in a classical style, allowing his imagination to roam free in the second act, since this part of the ballet has more fairytale elements and carries the sense of a dream. Saitto used this as an opportunity to insert elements from a variety of styles, including those characteristic of Egypt. “In fact, since my very early youth, I was always fascinated by Egypt and at a certain stage I wanted to become an Egyptologist. I was interested in its art and archaeology,” Saitto revealed to Ahram Online, adding that his upcoming summer collection is strongly inspired by Egypt. For Cairo audiences, Saitto presented his interest in the country through small lotus flowers that decorated the tutu skirts of dancers in the second act. More apparent were elements such as the short partial Egyptian-style tunics blending with classical costumes as well as the ancient Egyptian Eye of Horus (also known as The Eye of God Ra’) covering Dr Coppélius’ vest. Saitto metaphorically links the Eye of Horus with Coppélia’s second title: Girl with the Enamel Eyes. It’s worth adding that, equally, the choreographer gave a small yet noticeable hint of the Oriental in the short movements of two human dolls, secondary dancers situated on the elevation in the second act. The creative visions of both Bartes and Saitto complemented one another and inspired Egyptian scenographer Mohamed El-Gharabawy, who with Coppélia has created one of his most notable works on the Cairo Opera main stage. Whether an open court in the first act, or the enchanted inside of Dr Coppélius’s house in the second act, the audience was offered a well executed image of classical theatre. The two levels of scenography and the combination between dancers and life-size dolls made the whole experience even more magical. A lot can be written about this unique performance, yet it all can be summed up as a remarkable achievement. In its vibrant history, the Cairo Opera Ballet Company enjoyed many successes, as well as suffering days when the tide turned. However, with Egypt’s premiere of Coppélia, the company managed to reconfirm its position as a strong artistic troupe and a home to many talents. There is nothing more fulfilling than a well executed ballet production that brings together good dancers, a solid creative theatre backbone, supported by choreography, costumes, scenography and lighting design (by Yasser Shaalan) that draw coherent outlines and delve into many details — all this infused with great music. There is no better formula for success than the honest presentation of sheer art. This is when, regardless the audience’s age, the work will keep viewers on the edge of their seats, even if the production is over two hours long, as in Coppélia’s case. In Cairo, the matinee performances were filled with children projecting perfect behaviour and interest, expressed with their adorable comments about the details of the action and showering the artists with infinite applause. This is not to forget that Coppélia is also a rewarding artistic meal for the whole family, and all those ready to enjoy a fairytale, a dash of magic and much art. Hopefully, the ballet will not be limited to six performances in Cairo, and the ballet company and Opera will consider restaging it in the near future, extending to other locations in Alexandria and Damanhour, and — why not — other cities also. Matinee ballets that took place on 21 and 22 October were to recorded music. Evening shows are accompanied by the Cairo Opera Orchestra conducted by Sherif Mohie El-Din.